To me, that would be heaven. And I love that croissant is plural in this version of heaven. But equally heavenly would be sitting in a cafe in Rome or Florence, and having good, strong Italian coffee with a plate of chocolatey, crispy biscotti. Imagine having the time to sit in a cafe, watching the world go by, while you dunk your biscotti into your coffee? Though, knowing me, I’d watch the world go by while thinking of all the things I need to pick up at Target and Trader Joe’s. If it isn’t so easy to hop on a plane to Rome for coffee and biscotti, it’s easy enough to enjoy the coffee and biscotti in the warmth and comfort of your own home. Plus, you don’t have to deal with removing your shoes and dealing with long TSA lines. 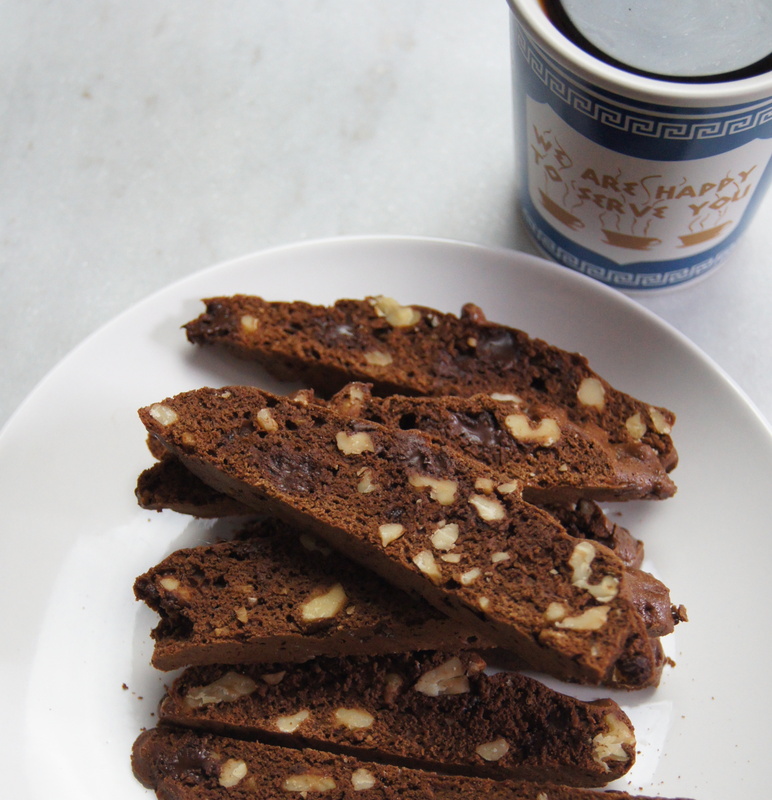 These Chocolate Espresso Walnut Biscotti are rich, yet simple. The espresso adds a nice, deep flavor without being overpowering and the rest of the ingredients are balanced out nicely. Not going to lie. The first time I made these and spread the dough out on my floured board, I couldn’t help but to think, “What did I get myself into?” The dough was so sticky and gooey and I was convinced that I didn’t add enough flour. I double checked the recipe and it turns out I did. But then I wasn’t so sure how the biscotti was going to turn out. Turns out I needed to have more faith in the process. When they were done baking after 20 minutes they looked so beautiful. And then when I cut them into logs and placed them back on the baking sheet to finish off the rest of the baking, they looked like legit biscotti. And I was so happy and relieved. Also, this recipe calls for 2 ounces of espresso powder dissolved in ¼ cup of hot water. It looks like a lot and it is. I had to use the entire container of Medaglia D’Oro Espresso Instant Coffee, but only needed 2 teaspoons for this recipe. I literally said, “What the actual f**k?” It’s way too strong to drink, so I’ll have to look for another baking use for the remaining espresso. I know, life is tough. Especially when it comes to making something sweet. 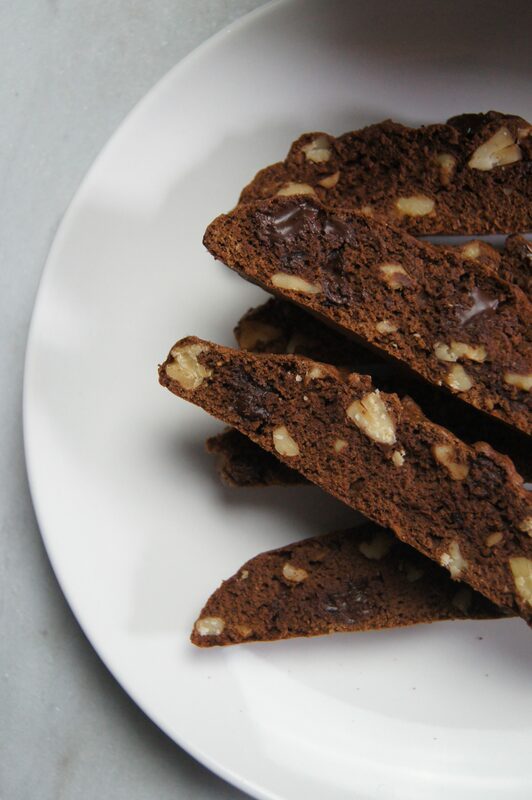 Even if you’re not sitting in a cafe while enjoying these biscotti, they’re a great accompaniment with your coffee while you steal a quiet moment in your day. A little decadent? Maybe. But it’s a nice balance and I think we all deserve something chocolatey every once in awhile. 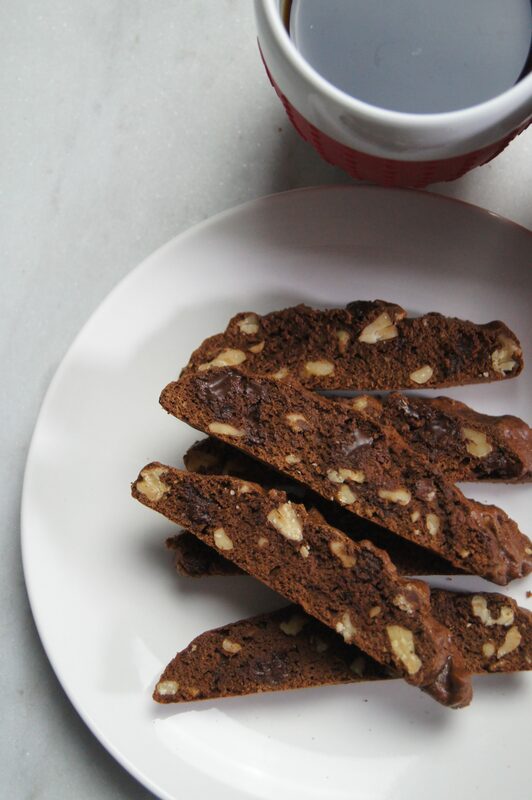 And these biscotti with coffee will put you in a good mood, and they’re great when you’re listing the things you need to get at Target and Trader Joe’s. For the coffee extract, slowly stir the hot water directly into the espresso powder, stirring well, then set aside. Preheat the oven to 350°F. Line a baking sheet parchment paper, and spread the walnuts in a single layer. Toast them, stirring occasionally, until they're lightly golden and fragrant, about 5 minutes. Remove from the heat and cool the sheet on a wire rack, keeping the oven on. In the bowl of an electric mixer fitted with the paddle attachment, combine the flour, cocoa powder, brown sugar, granulated sugar, butter, baking soda, and salt. Beat on low speed until the ingredients are well combined, about 4 minutes. In a medium bowl, whisk together the eggs, egg yolk, 2 teaspoons of the coffee extract, and vanilla. Add the mixture to the flour mixture and beat on low speed to combine. Add the cooled nuts and the chocolate chips, and beat just to combine. Turn the dough out onto a generously floured surface and divide it in half. Transfer each half to a parchment-lined baking sheet and shape each portion into a 16"x2" log, spacing them about 3 inches apart. Bake, rotating the sheet halfway through, until the logs are firm to the touch, about 20 minutes. Transfer the logs still on the parchment paper, to a wire rack and let cool slightly, about 5 minutes. Reduce the oven temp to 250°F. Transfer the warm logs to a cutting board, and using a serrated knife, cut the logs on the diagonal into 1/3-inch thick slices. Arrange the slices, cut side up, on the baking sheet. Bake until the biscotti are dry and firm to the touch, about 30-45 minutes. 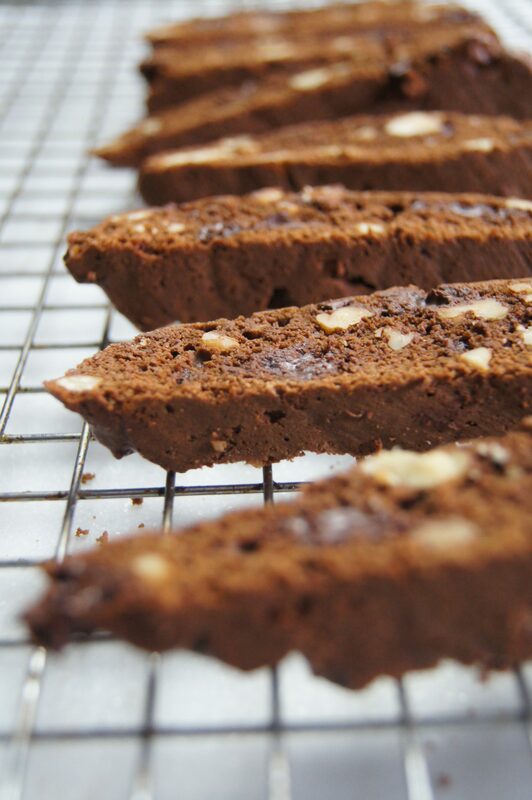 Remove the baking sheet from the oven and let the sheet of biscotti cool completely on the rack. 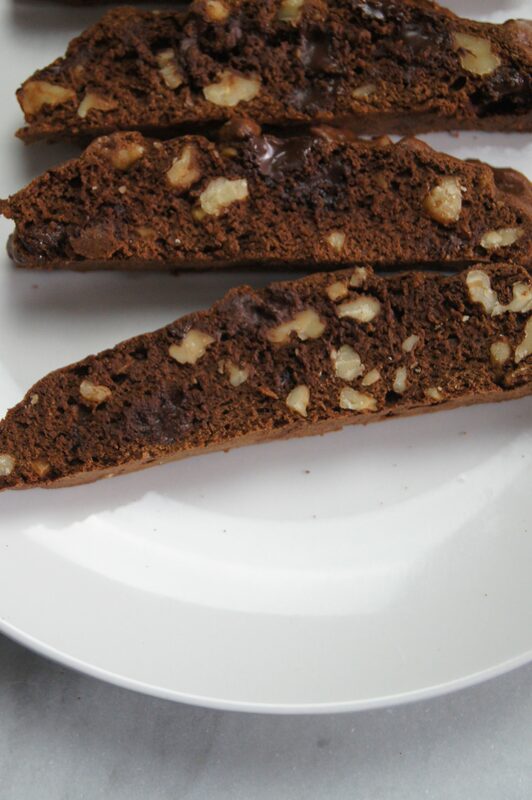 The biscotti can be kept in an airtight container at room temperature for up to 3 weeks.